The BASS-IC Cable Series has been a long time in development. An all-new subwoofer interconnect with very special properties designed and manufactured here in our UK factory. At MJ Acoustics our cables are hand built for hi-fi purists, to the highest standard using the finest quality materials available to us. Cables should never be seen to be an accessory to your hi-fi soundstage, on the contrary, they should be viewed as the veins carrying the lifeblood of your sound, from the heart of your system. The key to designing a cable optimized for the MJ Sub-Bass Systems begins, first by understanding the unique characteristics of our sophisticated input circuits known only to our design engineers. Incorporating the critically acclaimed Swiss-made Neutrik connectors allows the veins of your audio system to seamlessly connect with the sophisticated High-Level input stages of your MJ Sub-Bass System. Every part of an MJ Sub-Bass system is designed to match like the joining links of DNA molecules. In order to blend in seamlessly, there must be the very best of connections between the signal source and the MJ Sub-bass. 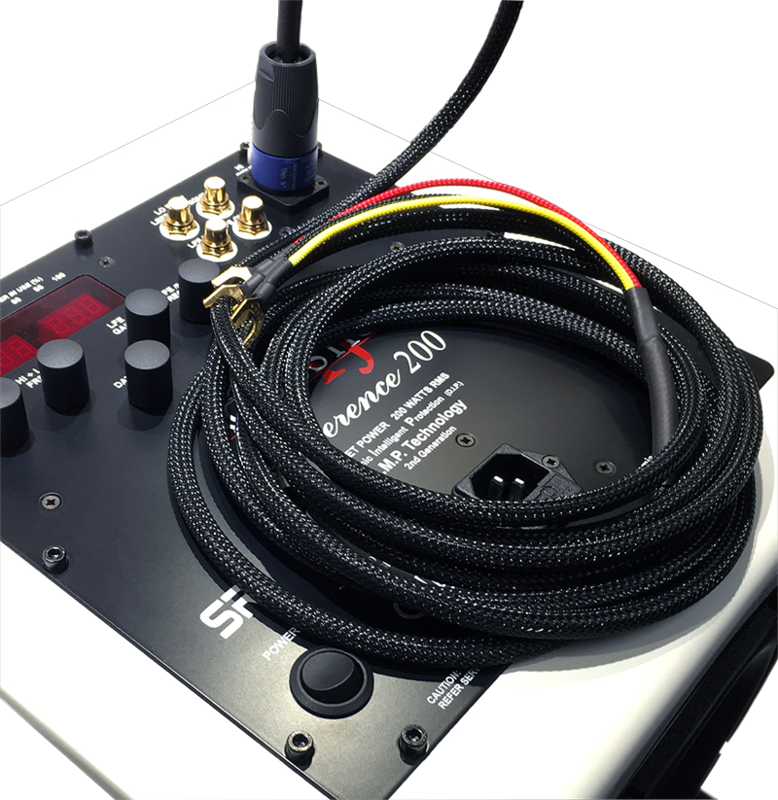 Our BASS-IC High-Level Cable features high-quality gold-plated spade terminals providing the optimal surface to surface electrical connection to compliment the most expensive High-End amplifiers and Speaker terminals. Ensuring the quality continues, our design team specified the use of the purest and most carefully processed dense Silver solder for creating the electrical joint to the silver coated oxygen free copper core conductors. The conductors at the core of these veins within the BASS-IC cable is crafted from military specification slow-drawn high purity copper. Upon leaving the extrusion die the core is coated with the most carefully processed silver to minimize the introduction of impurities within the conductors. Silver is used for this process due to its noble metal status alongside gold, both of which do not react in air, unlike copper. With both silver and copper bonded together, allows the combination of their conductive properties to work in harmony for the ultimate in pure uncoloured audio data transfer within these cores. The BASS-IC range is constructed using exclusively designed cable, manufactured in the UK following meticulous design specifications consisting of three individual cores. 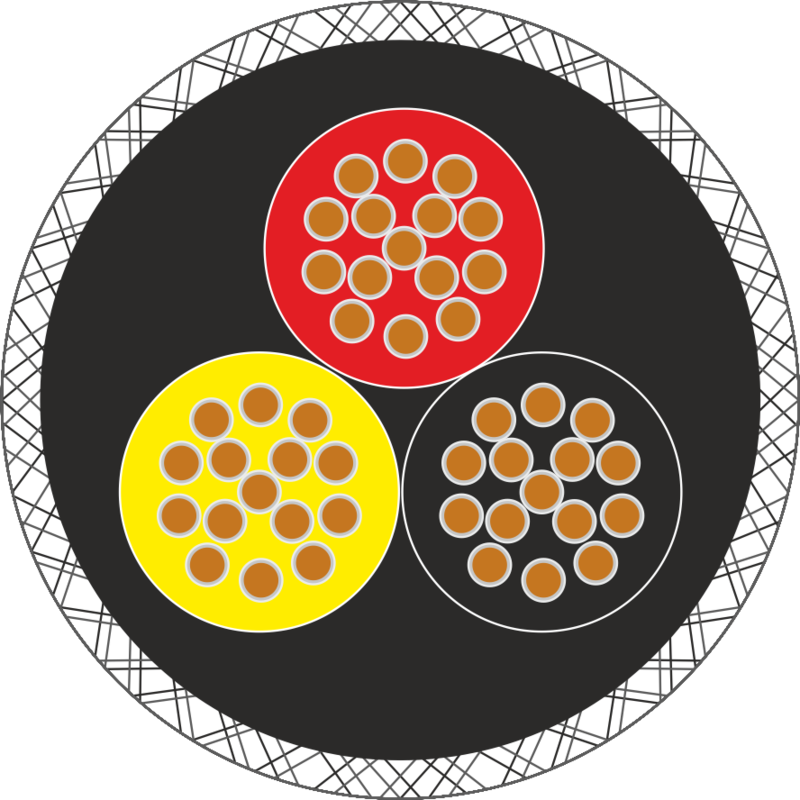 Each core contains fifteen singular conductor strands of silver coated copper wrapped in an insulation sleeve of a specially formulated (FEP) Fluorinated Ethylene Propylene, which is extruded along each core conductor. While the individual cores are insulated from each other they are still unprotected so our design engineers employed a (ULDPE) Ultra Low-Density Polyethylene jacket which, while retaining the properties of strength and density allow flexile movement. This particular composite material specified removes the damaging effect of mechanical noise by offering a damping effect. The cable is assembled within a flexible halogen-free polyester braided tube with interlocked braided weave designed, to further reduce mechanical noise, while providing an amour like protection for the flexible jacket. Remaining coherent and audibly transparent for even the most demanding of installation requirements. Each finished cable is meticulously assembled by highly trained MJ technicians to ensure not just distinctive repetitive standards of quality but superior audio performance, improving every aspect of an audiophiles listening enjoyment. As with every MJ product, the improvement is not only apparent in the lower octaves, but the ground-breaking way in which the entire soundstage is thrust into the spotlight creating a vastly more dynamic range while enhancing the clarity within the audio spectrum.